The Polar Bear (Ursus maritimus) is a marine mammal that inhabits the sea ice in the Arctic region of the Northern Hemisphere. They are the largest land carnivores on the planet, rivaled only by the Kodiak brown bears that are found in the southwestern portion of Alaska, Canada, Greenland, Norway and Russia. The polar bear sits at the top of the food chain in this cold, harsh environment. Their diet consists mostly of the fat of seals that share the region with them. Location: Arctic Circle – Canada, Alaska, Greenland, Russia and Norway. Predators: No Natural Predators, Only Other Polar Bears. An adult male polar bear, known as a ‘boar’ averages between 7 – 10 feet (2.5 – 3 meters) in length, and weighs between 750 – 1,550 pounds (350– 700 kg). An adult female polar bear, are roughly half the size of their male counterparts. 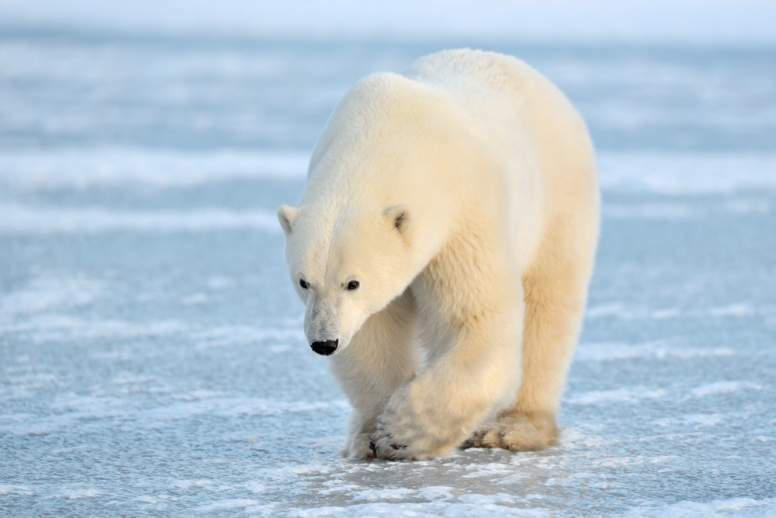 The polar bear has many different adaptations that have permitted the species to thrive and survive in the Arctic cold. The fur of the polar bear is thicker than that of any other kind of bear. It even covers their feet, to provide both warmth and traction. Buoyancy and insulation is provided by a thick layer of blubber beneath the fur. Polar bears also have long necks and narrow skulls that make them quite different from other bears and help to streamline the entire body shape for swimming. The front feet of the polar bear are flat, large and oar-like which assists in their swimming abilities. The global population of polar bears is estimated to be between 22,000 – 31,000 according to the IUCN, which lists them as ‘vulnerable’ due to decline in area of occupancy, extent of occurrence and quality of habitat – with particular concerns about the impact of climate change. 1. Polar bears are the largest land predators on the planet. Polar bears can weigh up to 750-kilograms (1,550 pounds) and can stand up to 3-metres (10-feet) tall. The average lifespan is 25 years and they can start to reproduce at age 4. 2. The fur of the polar bear is not really white, it’s transparent. Polar bears look as if they have a massively thick coat of yellowish-white fur. As it turns out, the hairs that make up their fur are clear and hollow. The coloring that appears as a yellow/white results from the reflection of and scattering of light. 3. Polar bears have jet black skin, which helps them keep warm. The polar bear has black skin which permits it to absorb heat. Their fur is whitish in color which allows these large land creatures to blend in with the snowy and icy environment they inhabit. 4. Although polar bears normally eat seals, they have been known to hunt and consume other items. Ringed seals and bearded seals are at the top of the list of foods enjoyed by polar bears. However, they do also eat walrus, reindeer, bowhead whale and beluga whale carcasses, rodents, bird’s eggs and on the rare occasion, vegetation such as roots. 5. They are a ‘hyper-carnivore’, as their diet is made up of more than 70% meat. They have 42 teeth to help them chew their meat and join other meat eaters, such as crocodiles, dolphins and most sharks in this hyper-carnivore category. 6. 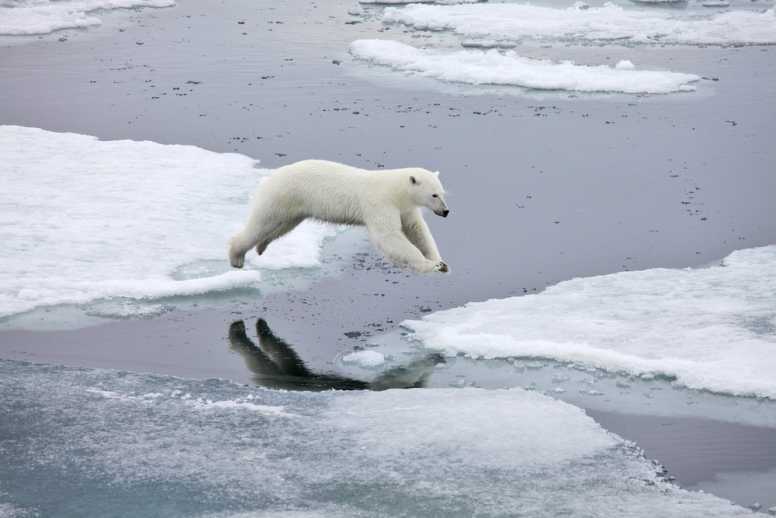 Polar bears use sea ice as a platform to catch their prey. Polar bears will travel great distances in search of prey and wait at breathing holes in the ice, to catch seals or any other animals that come up to catch a breath. 7. Polar bears are highly dependent on their harsh environment. Older, stable Arctic pack ice is where polar bears spend their time. They hunt, mate and den on the ice in the harshest winter months. 8. Polar bears are generally loners. Generally a solitary animal, the polar bear will break that rule during breeding season and while rearing cubs. Otherwise, you don’t normally see more than one at a time anywhere in the Arctic. 9. Polar bears are excellent, long-distance swimmers. 10. There is a small window for mating for polar bears. Mating season for polar bears runs from late March to May. 11. Polar bears have one huge distinction from brown bears. Male polar bears and non-breeding females do not hibernate during the winter months. 12. The polar bear reproductive cycle is slightly irregular. Gestation takes around 8 months but that includes delayed implantation. 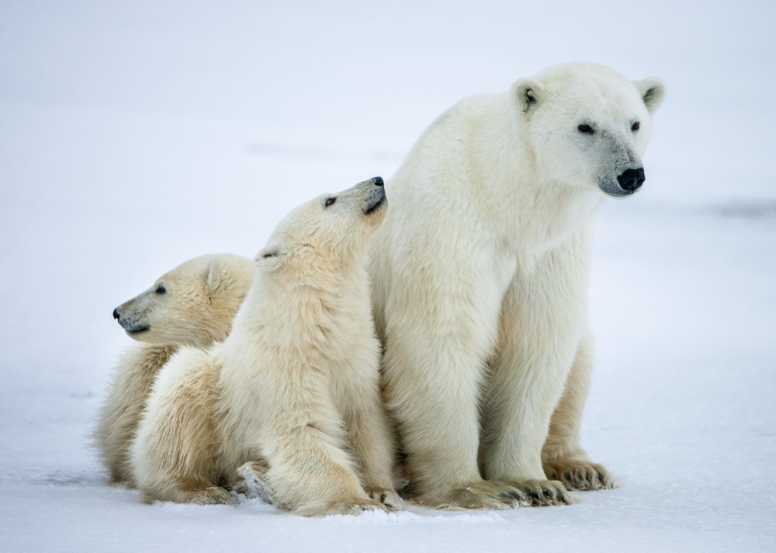 As for litter size, female polar bears can have between one and four cubs although one or two is most common. 13. Polar bear cubs are small when they are born. A polar bear cub will measure between 12 and 14 inches in length and will weigh not much more than a pound. 14. The denning process is rather complicated for female polar bears. A pregnant polar bear will fatten up during the summer and fall in order to build up sufficient fat reserves for the denning period. The maternity dens are usually located on land where snow will accumulate during winter. After giving birth, sows will nurse their young until they weigh between 20 and 30-pounds. It is only at that time when mother and cubs will leave the den for the first time. It is interesting to note that the cubs are born when their mothers are hibernating. A cub will stay with its mother for around two years. 15. Female polar bears have a low reproductive rate. They can produce up to five litters in their lifetime which happens to be one of the lowest reproductive rates of all mammals on Earth. 16. Polar bears Latin name ‘Ursus maritimus’, means ‘Sea Bear’. Which is befitting, considering they spend their lives on the sea ice. 17. Polar bears and humans have one thing in common. Despite the harsh environment polar bears call home, their layer of fur and blubber keep their body temperature steady at 37 C (98.6 F) – the same as humans. 18. They have an incredible sense of smell. Polar bears use their bionic sense of smell when hunting for seals. They can actually smell the breathing hole, or aglu, of a seal from over a mile away. Once the bear finds the hole, it will stay there waiting for another seal to pop up for air. When that occurs, the polar bear will attack! 19. Global warming is contributing to the fate of polar bears. With a reduction of large ice masses, it limits the access polar bears have to seals and this not only impacts the adult population, but it also hampers the reproductive cycle. 20. Polar bears are on the IUCN Red List. Although they are still plentiful in the Arctic region, polar bears have been designated as being ‘vulnerable’ according to the World Conservation Union.